Andy Balbirnie's maiden List A hundred charged Ireland to a four-wicket win in Dubai and handed New Zealand A their first loss of the tour. Ireland reached their target of 253 with six overs to spare after Balbirnie scored 129 off 96 balls. 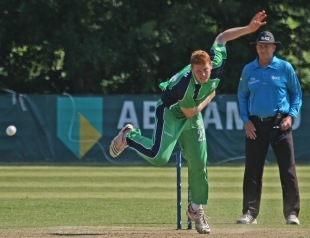 Ireland lost William Porterfield early for a 19-ball 2 in the seventh over before Niall O'Brien and Balbirnie got together for a 133-run stand in only 17.1 overs. O'Brien fell for a 67-ball 68 after hitting 10 fours and a six, at the score of 166. Gary Wilson also fell soon but Balbirnie steered the chase with Kevin O'Brien for a partnership of 53 runs, and brought up his hundred in just 70 balls with a four in the 30th over. He struck 21 fours and two sixes before being dismissed by Nathan McCullum five overs later. Ireland needed only 22 runs after that but lost two more wickets before scoring them. Earlier, New Zealand A got a strong opening start of 102 runs in 19 overs from Martin Guptill (41) and Anton Devcich (61) after they were put in to bat. However, Kevin O'Brien sent both of them back within five overs and soon dismissed Dean Brownlie and Luke Ronchi in the same over to reduce the score to 121 for 4. Colin Munro revived the innings by scoring 42 with Hamish Rutherford and 59 in 9.2 overs with McCullum (34). Munro and McCullum fell in successive overs and they were all out for 252 in 49.1 overs. Kevin O'Brien finished with 4 for 39 in 10 overs, including two maidens.